Studio Kroft is located in the centre of lovely Noordwijk, only 150 meters from the boulevard and the beach. 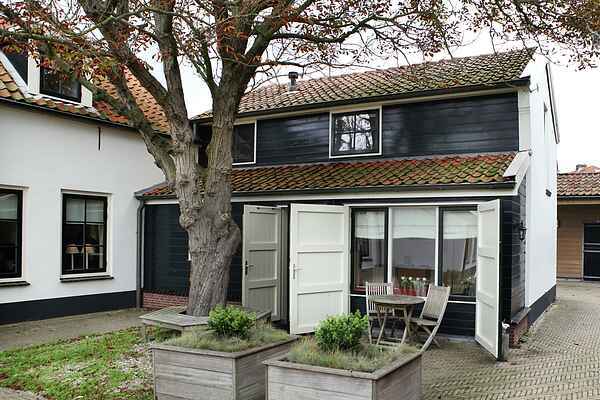 The studio is part of the oldest farm in Noordwijk aan Zee. In the past, the coastal town only consisted of a few farms in a dune-pan. The name Kroft is derived from the old Dutch word "kroft", a stream with clear dune water. Also in the studio, you can still find traces of its former life as a farm, such as the characteristic semi-circular windows. The studio is small but offers you plenty of comfort. There is a small kitchenette, and the sofa bed provides a simple sleeping place for the night (120 x 200). The location of the studio is ideal. Despite being in the middle of the centre, it is a haven of peace. Your studio is separated from the lively boulevard and the well-known Huis ter Duin by only one street. Everything is nearby, from bike rental to bakery with delicious sandwiches. The shopping centre is also within walking distance. The fashionable Noordwijk with its cosy boulevard is pleasantly crowded in the summer, but the coast of South Holland is recommended throughout the year. You can enjoy cycling in the area. The surrounding cities of The Hague, Leiden, Amsterdam and Haarlem are also worth a visit. Or enjoy the Keukenhof gardens filled with flowers.